This disposable drinkware mimics the aroma-enhancing shape of specialty beer glasses for a premium drinking experience in spaces where glass isn't permitted. Certain beer drinking situations (e.g., large social gatherings, poolside, festivals, camping, picnics, the beach) don't lend themselves to using specialty glassware. Either glass isn't permitted or there are so many people that owning and washing all those glasses is impractical. In said scenarios, Craft Cups Disposable Plastic Tulip Beer Pint Cups are the next best thing. The tulip shape of this unique brand of disposable drinkware enhances the aroma and flavor of your beer much like an actual tulip glass, but without any chance of breakage. And like a standard pint glass, they hold a full 16 ounces of beer. Each disposable cup in this package of 24 is made from 100% recyclable, clear PET plastic and features a stackable design for easy transport and storage. Pick up a pack today for your next event. Been wondering why I have not seen something like this out there yet. Really enjoy using these cups while out at the park or beach. Will definitely be ordering again. Really pleased with this product and the value. I wanted disposable pint glasses for a party, and Kegworks delivered. 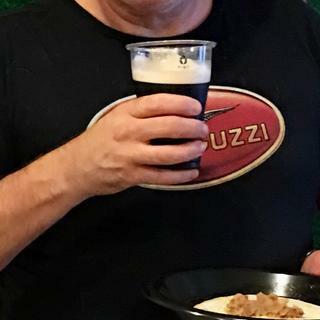 Because of the shape, it allowed for a good head on the Guinness stout we served, which was exactly what I was looking for. Well done guys. Not the best pic, but you can see the nice head on that stout. Thanks, Erica! Glad to hear that the cups were a success for your party! Cheers! The beer cups were well appreciated for the local brewery beers we served at the wedding/picnic. A great alternative to the red plastic cups. A full pint and clear view. Perfect go pool side. We were looking for a nice disposable beer cup for an upcoming wedding and these were perfect!